I. The appeals of the opponent (appellant 1) and the patent proprietor (appellant 2) both aim at setting aside the interlocutory decision of the opposition division on the amended form in which European patent No. 1 789 717 could be maintained. The provisions governing the admissibility of appeals are Articles 106 to 108 EPC. An appeal can only be admissible if the notice of appeal is filed by a party adversely affected (Article 107 EPC 1973) by an appealable decision (Article 106 EPC), within two months of notification of the decision (Article 108 EPC). Pursuant to Rule 99 EPC the notice of appeal has to contain the name and the address of the appellant (Rule 99(1)(a) EPC), an indication of the decision impugned (Rule 99(1)(b) EPC) and a request defining the subject of the appeal (Rule 99(1)(c) EPC). Non-compliance leads to the appeal being declared inadmissible (Rule 101 EPC). In the name of: B.V. Holmatro Industrial Equipment ...". There is no further statement that would allow to directly determine the identity of the appellant. The decision impugned is identified ("la décision de la Division d'Opposition du 19 octobre 2011"). The notice of appeal does not contain any request defining the subject of the appeal other than the statement "we file an appeal against the decision ..." ("... nous formons un recours à l'encontre de la décision ..."). In what follows, the board will examine in detail whether this notice of appeal complies with the requirements of Rule 99(1) EPC. The notice of appeal is signed by Bruno Vuillermoz, who is identified as a member of the Laurent Charras law firm, whose address is also given. Neither Mr Vuillermoz nor the law firm are parties to the opposition proceedings. However, Mr Vuillermoz is the person who was named as the professional representative acting for the opponent in the notice of opposition, to whom all the correspondence for the opponent (i.e. the decision under appeal) was addressed and who represented the opponent during the oral proceedings before the opposition division. Being a professional representative, Mr Vuillermoz may be expected to be familiar with the provisions governing appeals and in particular with the fact that an appeal filed in his own name would have to be held inadmissible in the present opposition case. Therefore, it appears unlikely that Mr Vuillermoz intended to file an appeal in his own name. Decision J 1/92 of 15 July 1992 is not relevant because in the case underlying that appeal the representative had expressly stated in the notice of appeal: "The appeal is lodged in my own name ..." (see point IV of the Summary of Facts and Submissions). One can of course imagine a situation in which the professional representative who has represented the opponent before the opposition division then takes up the representation of the patent proprietor (possibly in breach of professional rules concerning conflicts of interest) and files an appeal in the latter's name, mistakenly using the reference he used when he represented the opponent. However, such a situation is extremely unlikely to occur (appellant 2 itself spoke of "a silly assumption"); moreover, there is no indication whatsoever in the case file that a change of representative had taken place. It is also extremely unlikely that Mr Vuillermoz would have filed the appeal on behalf of other competitors of the patent proprietor that had an interest in having the opposed patent revoked. Even if such a third party had approached the representative of appellant 1, the representative would have had to tell that party that an appeal in the third party's or his own name would necessarily be unsuccessful and that the only way to obtain a revocation before the EPO would require an appeal on behalf of the opponent. The board is unable to discern any evidence for the alleged "trade in opposition" in the documents on file. The fact that another competitor has supplied appellant 1 with document D4 does not establish that appellant 1 is identical to this competitor. It can be in the interest of a company to help a competitor in its attempt to have another competitor's patent, which hinders both of them, revoked. It should also be noted in the present context that an appeal "on behalf of the patent proprietor" was filed on 22 December 2011, i.e. six days after the notice of appeal under consideration. Considering all the elements on file, the board is satisfied that a reader willing to understand would have understood, before the end of the time limit for filing an appeal, that the notice of appeal of 16 December 2011 had been filed on behalf of the opponent. There is no reasonable doubt as to the identity of appellant 1. In its decision G 1/12 (OJ EPO 2014, A114) the Enlarged Board of Appeal has established that an erroneous indication of the name and address of the appellant in the notice of appeal can be corrected under Rule 101(2) EPC. The present board is of the opinion that the omission of the name of the appellant (or the erroneous indication of the name of the patent proprietor, as the case may be) in the notice of appeal under consideration qualifies as an error, the true intention of Mr Vuillermoz having been to file the appeal on behalf of the opponent. Appellant 1 has filed the correct name of appellant by letter of 20 June 2012 and its address by letter of 4 August 2015. Therefore, the board finds the requirement of Rule 99(1)(a) EPC to be fulfilled. The notice of appeal refers to the "decision of the opposition division of 19 October 2011". As a matter of fact the opposition division had decided that the patent could be maintained in amended form on the day of the oral proceedings (4 October 2011). It appears not to have taken any decision regarding this opposition on 19 October 2011. However, as the reasoned written decision has been dispatched in a communication dated 19 October 2011, a reader willing to understand would have understood the notice of appeal to refer to the decision of the opposition division dated 4 October 2011. The notice of appeal of appellant 1 states that the appellant files an appeal "against the decision of the opposition division ...". The critical question is whether this can be considered as "a request defining the subject of appeal" within the meaning of Rule 99(1)(c) EPC. Rule 64(b) EPC 1973 requires the notice of appeal to contain "a statement identifying the decision which is impugned and the extent to which amendment or cancellation of the decision is requested". Pursuant to Rule 99(1)(c) EPC  the notice of appeal shall contain "a request defining the subject of appeal"; Rule 99(2) EPC adds that the appellant shall indicate in the statement of grounds of appeal "the reasons for setting aside the decision impugned, or the extent to which it is to be amended ..."
As a consequence, under the EPC 2000, the extent of the requested amendment does not have to be indicated in the notice of appeal any more but can be filed with the statement setting out the grounds of appeal, i.e. at a later stage. Therefore, the question arises what exactly is meant by the "request defining the subject of the appeal" mentioned in Rule 99(1)(c) EPC. What is clear is that it is a request and that this request cannot concern the extent to which amendment of the decision is requested. In the present case the opposition division had found the subject-matter of the third auxiliary request to comply with the requirements of the EPC. Consequently, it has not examined the subject-matter of the fourth auxiliary request on file. In such a situation the appeal of the opponent could have different purposes. First, the opponent might wish to have the patent revoked rather than maintained in amended form. This is without doubt the most common situation. Secondly, the opponent might have found the fourth auxiliary request before the opposition division acceptable; in that situation the appeal would have the purpose of having the patent maintained with smaller scope. Appellant 2 considered that in this situation the request defining the subject of the appeal of appellant 1 would be the indication of whether the opponent requested the patent to be revoked or to be maintained according to the fourth auxiliary request on file. There is some merit in appellant 2's argument that otherwise the requirement of Rule 99(1)(c) EPC would be superfluous. If the requirement is satisfied by the general request that the decision under appeal be set aside, then it is virtually always satisfied because this request is implicit in the filing of the appeal, the very purpose of which is to have the impugned decision be set aside. In other words, the appeal as such expresses this request and one can hardly imagine an appeal that would not comply with Rule 99(1)(c) EPC if the provision is understood in that way. This notwithstanding, the board also has to take account of the established jurisprudence. The boards have repeatedly construed the appeal of patent proprietors against a decision to revoke the patent as a request that the decision be set aside in its entirety, even though there had been auxiliary requests before the opposition division (see in particular T 358/08 of 9 July 2009, points 1 to 5 of the reasons). Similarly, in appeals against the rejection of the opposition the appeal of the opponent was construed as a request to set aside the decision under appeal and revoke the patent (see e.g. decision T 9/08 of 1 October 2010, point 1 of the reasons - again, several requests of the patent proprietor were on file; more recent decisions: T 183/12 or 9 August 2013, point 1 of the reasons, and T 256/13 of 2 June 2015, point 1 of the reasons). As a consequence, the board reaches the conclusion that in the present case the notice of appeal filed by the opponent has to be construed as comprising a request that the decision be set aside in its entirety, and that the requirements of Rule 99(1)(c) EPC are fulfilled. The appeal of appellant 1 is admissible. 1. The appeal of appellant 1 is admissible. 2. The decision under appeal is set aside. 3. The patent is revoked. 4. The appeal of appellant 2 is dismissed. This decision T2561/11 (pdf) has European Case Law Identifier: ECLI:EP:BA:2016:T256111.20160704. The file wrapper can be found here. 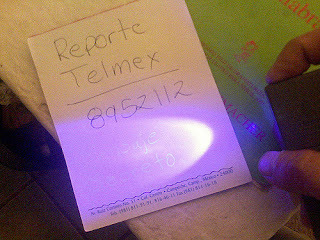 Photo "Invisible Ink" by Felix E. Guerroro obtained via Flickr under CC BY-SA 2.0 license (no changes made).